Once upon a time India was called as “Sone Ki Chidiya”(golden bird), but today we cannot even say “Chandi ki Chidya” (Silver bird) to India. Today India means sluggish Indian economy, poor people, black money, corruption, scams, lake of governance, terrorism, poor infrastructure, unemployment, deprived law and order and lot more. In order to address all these issue and revive Indian economy people selected Narendra Modi as prime minister in recent lok sabha election. Majority of people believes that Modi will replicate Gujarat growth model in India and make India “Sone Ki Chidiya”(golden bird) again. Well time will reveal that how Modi government will operate and at what level he is getting success. Well today I am going to discuss about proposal made by Arthakranti Sansthan to revive Indian economy. Mr.Arun Bokil , one of the key member of Arthakranti Sansthan was given time to share to PM Modi before recent election. He was given 9min for sharing but Mr Modi heard him for 2 hrs. What is Arthakranti Proposal and who has given the proposal? It was the proposal to revive Indian Economy. “Arthakranti Proposal” has been given by a Pune (Maharashtra) based “Arthakranti Sansthan” which is an Economic Advisory body constituted by a group of Chartered Accountants and Engineers. This funda has been patented by the Sansthan. Arthakranti Proposal is an effective and guaranteed solution of Black Money Generation, Price rise and Inflation, Corruption, Fiscal Deficit, Unemployment, Ransom, GDP and industrial growth, terrorism, good governance & growth of Indian economy. “Arthakranti Proposal has five point of actions simultaneously. (1) Scrap all 56 Taxes including income tax excluding import duty. (2) Recall and scrap high denomination currencies of 1000, 500 and 100 rupees. (3) All high value transaction to be made only through banking system like cheque, DD, online and electronic. (4) Fix limit of cash transaction and no taxing on cash transaction. (1) As on today total banking transaction is more than 2.7 lakh crores per day say more than 800 lakh crores annually. (2) Less than 20% transaction is made through banking system as on today and more than 80% transaction made in cash only, which is not traceable. (3) 78% of Indian population spend less than 20/- rupees daily why they need 1000/- rupee note. (1) Salaried people will bring home more money which will increase purchasing power of the family. (2) All commodities including Petrol, Diesel, FMCG will become cheaper by 35% to 52% . (3) No question of Tax evasion so no black money generation. (4) Business sector will get boosted. So self employment. (1) Corruption through cash will stopped 100%. (2) Black money will be either converted to white or will vanish as billions of 1000/500/100 currency notes hidden in bags without use will become simple pieces of papers. (3) Unaccounted hidden huge cash is skyrocketing the prices of properties, land, houses, jewellery etc and hard earned money is loosing its value; this trend will stop immediately. (4) Kidnapping and ransom, “Supari killing” will stop. (5) Terrorism supported by cash transaction will stop. (6) Cannot buy high value property in cash showing very less registry prices. (7) Circulation of “Fake Currency” will stop because fake currency printing for less value notes will not be viable. (1) As on today if BTT is implemented govt can fetch 800 x 2% = 16 lakh crore where as current taxing system is generating less than 14 lakh crore revenue. (2)When 50% of total transaction will be covered by BTT sizing 2000 to 2500 lakh crores, Govt will need to fix BTT as low as 1% to 0.7% and this will boost again banking transaction many fold. (3) No separate machinery like income tax department will be needed and tax amount will directly deposited in State/Central/District administration account immediately. (4) As transaction tax amount will be very less, public will prefer it instead paying huge amount against directly/indirectly FIFTY SIX taxes. (5) There will be no tax evasion and govt will get huge revenue for development and employment generation. (6) For any special revenue for special projects, govt can slightly raise BTT say from 1% to 1.2% and this 0.2% increase will generate 4,00,000 crores additional fund. (1) Prices of all things will come down. (2) Salaried people will get more cash in hand. (3) Purchasing power of Society will increase. (4) Demand will boost, so will production and industrialisation and ultimately more employment opportunity for youth. (5) Surplus revenue to the government for effective health/ education/ infrastructure/ security/ social works. (6) Cheaper and easy loans from banks, interest rate will come down. (7) Tendency of society will changes from scarcity to quantity. (11) Sufficient fund for research and development. (12) Society will be free from “Bad elements”. 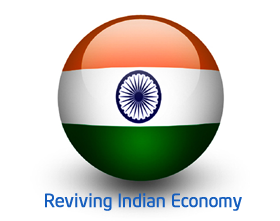 Do you agree with this Arthakranti Proposal to revive Indian economy? Just pass on this post by facebook or twitter to confirm your agreement. Idea is excellent. But, the politicians won’t agree as their chance to earn black money will be stopped for ever. So is the case of businessmen, doctors, lawyers etc. Let the Prime Minister take initiative. He is only man who can be hoped for creating a nation free from corruption. EXCELLENT. BUT THE POLITICIANS,BUSINESSMEN ,OTHER ILLEGAL ACTIVITIES WONT ALLOW IT TO IMPLMENT. A person who has worked all his life in private sector and earns an EPF pension as low as Rs.500/- per month and below poverty Old Age pensioners and other welfare pensioners with no other source of income other than pension, will he be taxed when this amount is credited to his bank account?. If out of their life savings they get Fixed Deposit Interest for living will this amount also taxed when credited to his account?. If he withdraws his principle amount and this is credited to his account will this amount also be taxed?. If so the poor will become poorer. Good and well researched article Raviraj.